Le Roeulx has been one of the main residences of the Princes of Croÿ since 1429. It is one of the most imposing classical castle in the country. 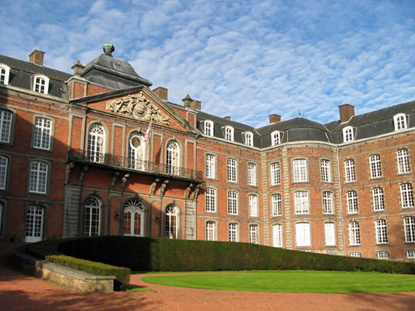 Its history overshadows that of all but the most prestigious residences in the Low Countries. The village of Le Roeulx produces the renowned St Feuillien beer. The St Feuillien Triple was listed as highly recommended standard pale ale by the World Beer Awards 2009. The exact origins of the seigneury of Le Roeulx are shrouded in mystery. It is known that in the 11th century Le Roeulx was one of the twelve pairies ("peerages") of the County of Hainaut. The first lord mentioned was Arnold, son of Baldwin II (1056-1098), Count of Hainaut & Flanders. Arnold's son, Eustache II († 1186), erected a stone castle with several towers, parts of which still stand today, in the northwestern corner of the castle. Eustache III († 1218), son of the preceding, joined the Third Crusade. He died without posterity, and the lordship of Le Roeulx returned to the Counts of Hainaut. In 1429, Jacqueline of Bavaria, Duchess of Bavaria-Straubing, Countess of Hainaut and Holland, cedes the seigneury of Le Roeulx to Anthony of Croÿ (1385-1475), Governor General of the Netherlands and Luxembourg. The castle still belongs to his descendents nowadays. The castle received quite a few eminent guests under the patronage of the Croÿ family. The most illustrious monarchs to visit Le Roeulx were the Dukes of Burgundy, Philip the Good and his son Charles the Bold, Emperor Maximilian I, Emperor Charles V, and his son King Philip II of Spain, Margaret of Parma, the Queen of France Marie de' Medici, the Archdukes of Austria Albert and Isabella, as well as Queen Christina of Sweden. Marie de' Medici even had her own private apartments in the castle. The present classical façade was commissioned by Ferdinand Gaston-Joseph, Duke of Croÿ, who also added the two wings in 1713 and 1760. A few days before the famous Battle of Waterloo on 18 June 1815, the Duke of Wellington and the Prince of Orange (the future King William II of the Netherlands) held a council of war at the castle of Le Roeulx. The castle was closed for renovation at the time of writing. Contact the castle (see official website) for updates on the situation. The park of the castle is normally open on the first Sunday of June for one of Belgium's biggest hot air balloon festival (50 to 100 balloons). The village of Le Roeulx is situated a few kilometres north-west of La Louvière, along the E19/E42 motorway (exit 21). Access by car is consequently very easy from any cities on the E19 (e.g. Brussels, Nivelles, Mons, Valenciennes) or the E42 (Liège, Namur, Charleroi, Mons, Lille).